As an example, at a recent customer deployment, Federation wasn’t working for users on a new Lync Pool. This was a large and rather complex environment that was still in co-existence mode with OCS R2 and I didn’t want to have to dig through a bunch of logs. But have no fear, PowerShell came to the rescue! In the example above, the user will first connect to “1:1-2” which is EE2.contoso.local. If for any reason that server is unavailable, the next server tried will be ee1.contoso.local. If the user’s home server is up and running, their Lync client will connect to it. 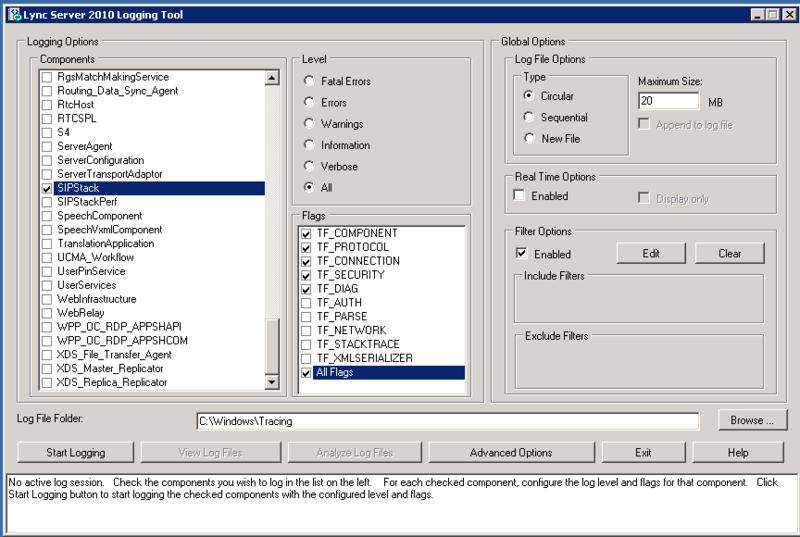 This allows the administrator to run Logger just on that server for troubleshooting purposes. This will make your job a little bit easier. use “eepool.contoso.com” as its logon server. I’ve also enabled logging so we can examine the results in Snooper. By default the logs can be found in %userprofile%\tracing and will be named “Communicator-uccapi-0.uccapilog”. This file can be opened with Snooper. Snooper is available from the Lync Resource Kit available here. as the client has not authenticated yet. After the three “401 Unauthorized” messages, you will see a new Register attempt. This time with an authentication type set. preferred server by the “q=0.7” section at the end of the first “Contact” line. client its Backup Registrar is “se.contoso.local”. The Backup Registrar can be a Lync Standard Pool or an Enterprise Pool in a backup datacenter. Now that our client knows which server it should talk to, we attempt to register to the new server. As in the previous case, the client will receive three “401 Unauthorized” errors before it successfully registers using TLS authentication. is down, our client will connect to the backup pool after the failover interval has elapsed. After I’ve started and stopped logging, I can click the “Analyze Log Files” button and as long as snooper is installed, I’ll be able to jump right into troubleshooting from the server. This entry was posted in Uncategorized and tagged Communicator, Enterprise Edition, Logging, Lync, Lync 2010, Lync Server 2010, Preferred Home Server. Bookmark the permalink. Question. I see when you connected to EE2 you got in-band what the backup registrar was (se.contoso.com). But I thought you need a registar based on what the “Another Reason to Include a Director in Your Lync Server 2010 Deployment” stated. Was this fixed in a recent patch so now the FEs will provide in-band what the Backup Registar is? Nevermind. I see it’s because you’re pointing to the wrong Pool Member, get the 301 redirect, and because you get the 301 redirect you see both the primary and backup.